A North Texas couple claiming to have been abandoned by a pool contractor now have a new backyard, thanks to a generous business owner. 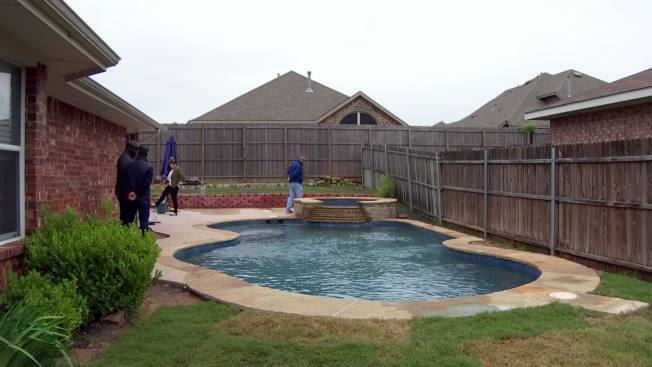 The Turner family, in Rowlett, paid Poolscapes NTX more than $54,000 to renovate their backyard. But it didn't end the way they wanted. The Turners said Chris Michaels, the owner of Poolscapes NTX, told them he couldn't afford to finish the job because he had to use their money on other projects. He said he was filing for bankruptcy, going out of business, and that he was sorry. The Turner's just wanted a finished backyard. "For a company in our industry you know to come in and do this to people that work hard for their money, it's heartbreaking," said Victor Fimbref, general manager of Hobert Pools, in Dallas. He saw our story on NBC 5 Today last month. "So I brought the crew and said okay, let's get a game plan going and let's finish this man's pool," Fimbref said. Nearly a month later, the Turners' pool and spa are now complete. What would have cost them another $25,000 was taken care of by Hobert Pools — on the house. Now this Rowlett couple couldn't be happier. "If your wife's happy, your children are happy, to a father, that's major," said Steven Turner. "It's a family business, this is what we do. And for us it was you know kind of welcome you to our family," Fimbref said. It's a tragic tale that evolved into a miracle for the family. "For a while I didn't trust anybody, it allowed me to have that trust again," said Turner. The Turners still have a $7,000 lien on their home from a subcontractor who wasn’t paid by the original contractor. They said it’s something they’re still trying to figure out, but are glad to have the pool project behind them.